In fifty years of activity we have created plants of all kinds, always custom-designed in accordance with the single industrial situation, to ensure the highest level of quality and operation. We have tackled and successfully solved every type of problem in the field of manual handling of loads, creating new plants and specializing in finding efficient and ergonomic solutions. Every time we deliver a new plant is as if it were the first: the Customer and operators satisfaction is our best reward. 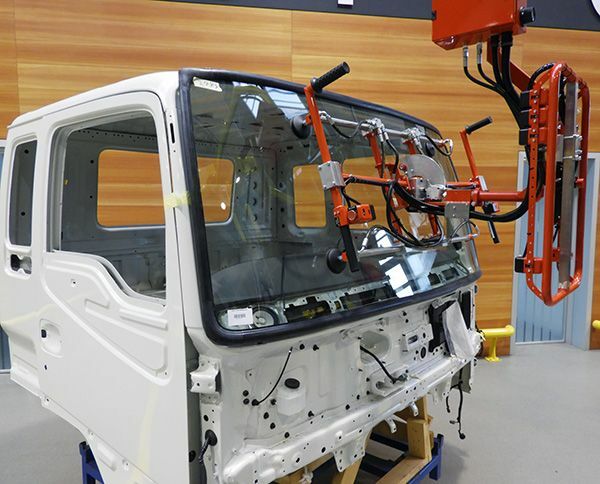 In this specific project we have manufactured a system composed of two manipulators Partner PE type overhead running version, for the fitting out of an industrial vehicle. 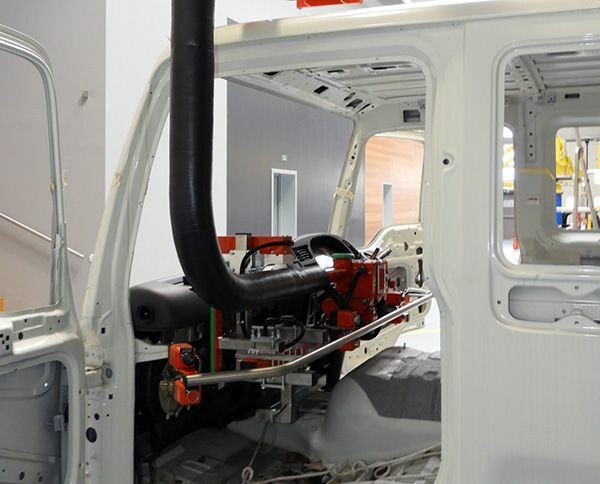 The first manipulator is equipped with a pinch jaws device designed for the gripping of the dashboard from special supports and allows the insertion and installation of the same inside the vehicle cabin; the second manipulator is equipped with a suction cups device for the installation of the windscreen. The installation is complete with an overhead running system with pneumatic motorization to facilitate the sliding in the tracks, composed of two opposite aluminium U-shaped profiles with connecting and stiffening ribs, complete with attachment points for an overhead suspension and end buffers. The various parts are jointed with screws.